The day started out with a Happy Birthday FaceTime call from Jess’s family back home. I told them about the day that Steven had planned for me and we were so excited. About 20 minutes later, there was a knock on the door; our breakfast was here! 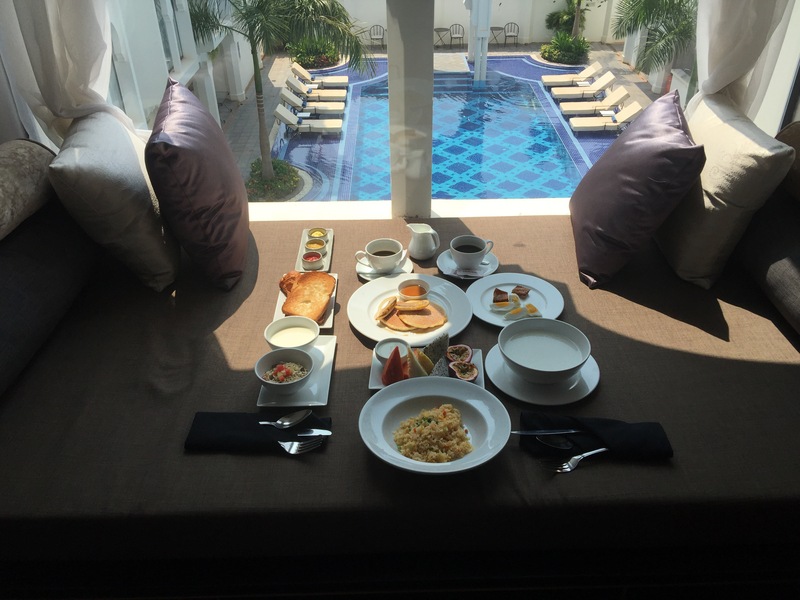 We enjoyed breakfast in bed (included with our room) at The Sarai Resort and Spa; it was more like a feast. Jess had the traditional Cambodian soup with rice noodles bok choi and bean sprouts as well as home made yoghurt with muesli and fresh papaya, jackfruit, passionfruit, and pineapple. Steven had plain congee, which is similar to porridge, but made with rice that is cooked in water for many hours or overnight. This was accompanied by smoked fish and a salted duck egg. We shared some buttermilk pancakes, but they were nothing like Jeffrey’s pancakes that Jess was craving. They accidentally also brought us vegetable fried rice, which we hadn’t ordered, but we definitely enjoyed anyway. Breakfast was also served with a piece of toast, a croissant and a chocolate croissant. Everything was really good and it was a great way to start off our day: with a big meal. Little did we know having this big breakfast would really save us later that day. When we finished up we got dressed for the day and headed down to the lobby to meet Scott from Subai Tours. Scott is from Canada and he introduced us to our guide for the day, Sin. 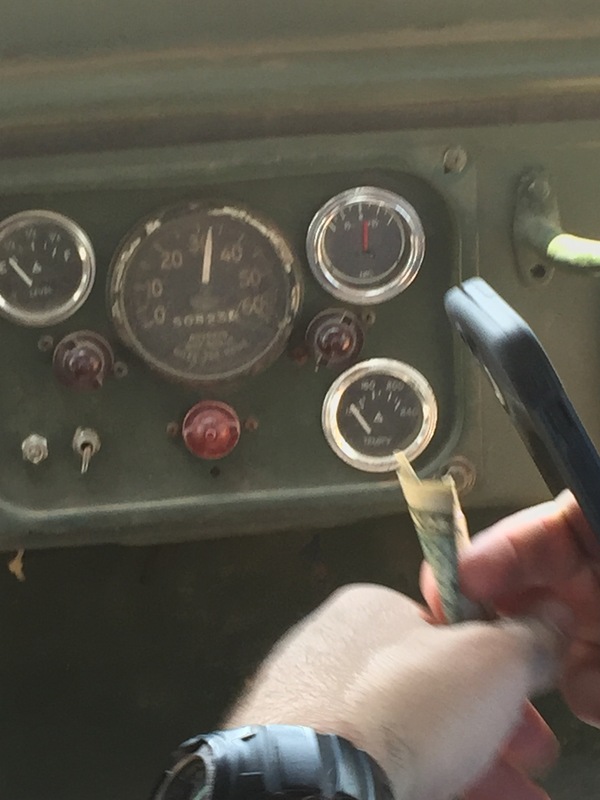 We walked outside to our ride: an old American Jeep found from after the war. We hopped in and started our adventure out of the big city. 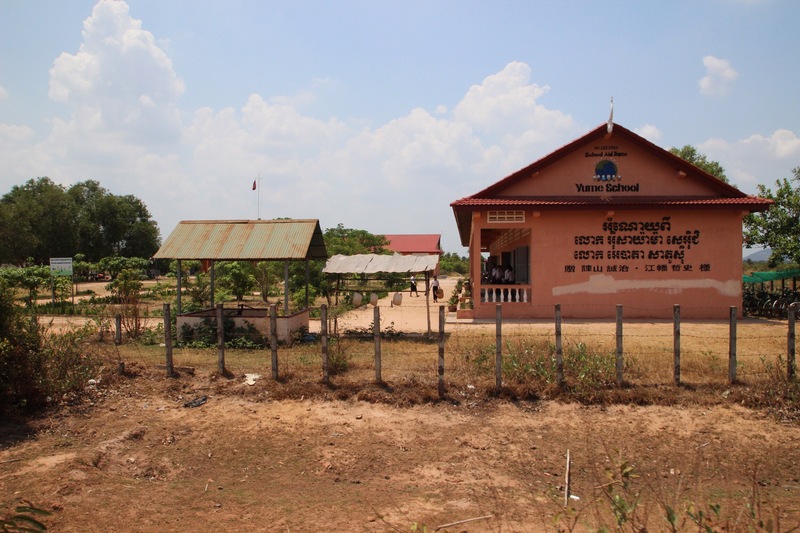 We drove through the countryside on the red dirt roads and were transformed into the lives of the rural Cambodian people. The views were of dried up rice paddies and bamboo houses here and there. Being that it is the dry season, what is usually lush green and full of life is currently brown and golden. 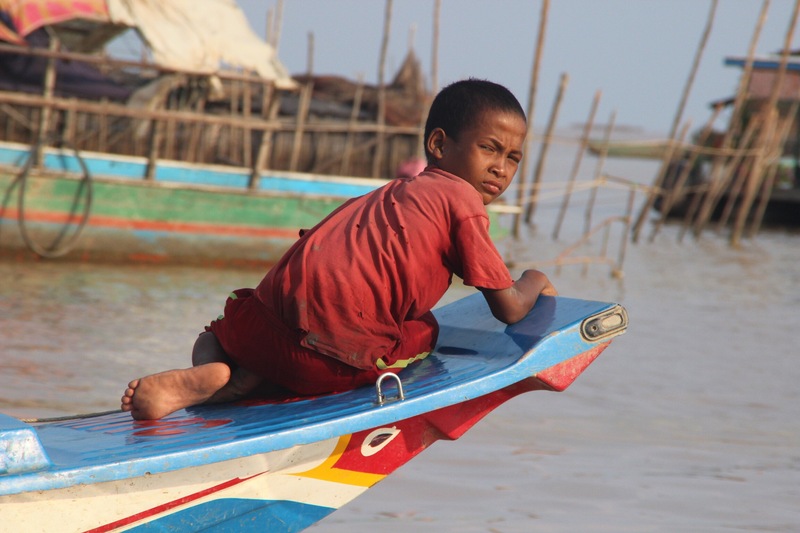 As a result, many of the locals who work in the rice fields are currently out of work. 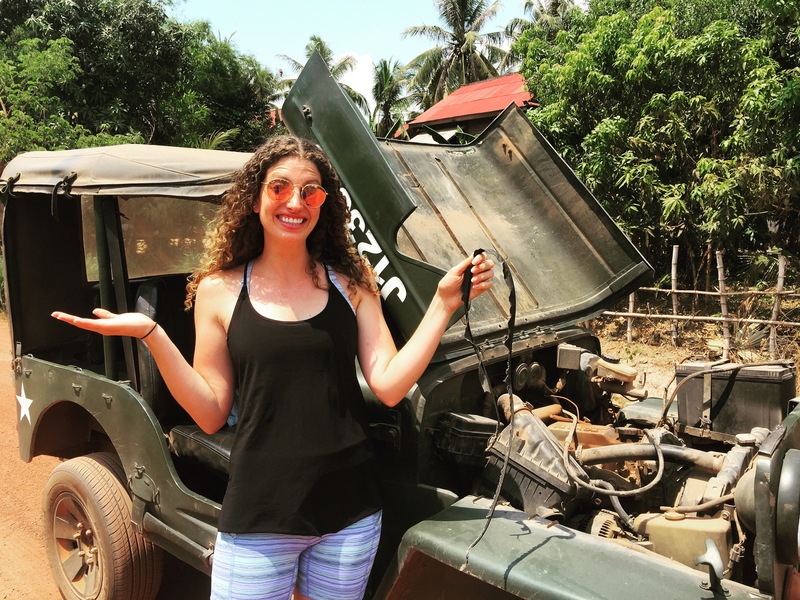 After about an hour and a half of bumpy dirt roads and endless dried up rice paddies, we heard a screeching noise from the hood of the car and immediately came to a stop. We pulled over and popped the hood to find that one of the belts had been shredded and coiled up into the radiator fan. We called Scott and he said he would grab his mechanic and bring some parts to try to fix it so we could continue our journey. We were pretty far from town at this point so we knew the wait would be quite a while and it was nearing 100 degrees Fahrenheit. We happened to have stopped right in front of a home where a woman was outside washing clothes. Sin explained to her what had happened and asked if we could sit in the shade while we waited for Scott to arrive. Her name was Thoa and she opened her home to us without hesitation. 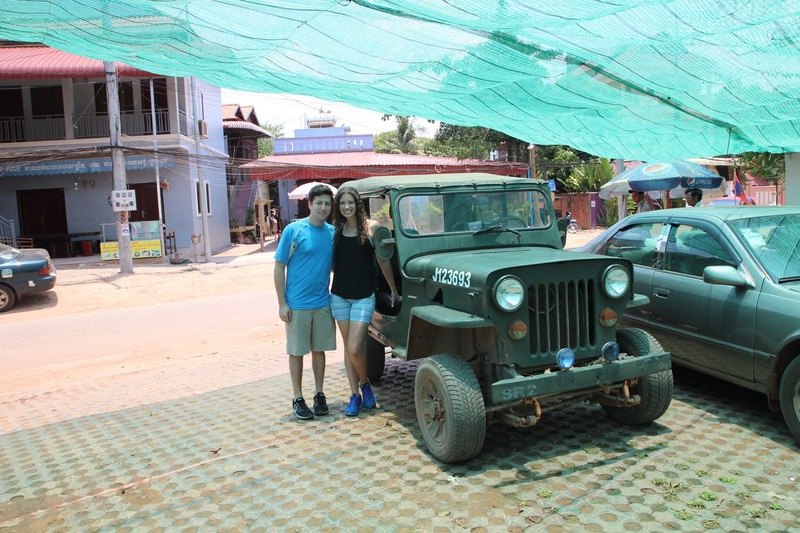 Although we were not moving forward and continuing our trip at this point, we realized that we were having an experience of a lifetime and meeting someone who was so kind was just as good as, if not better than, driving on a dirt road in an old jeep. 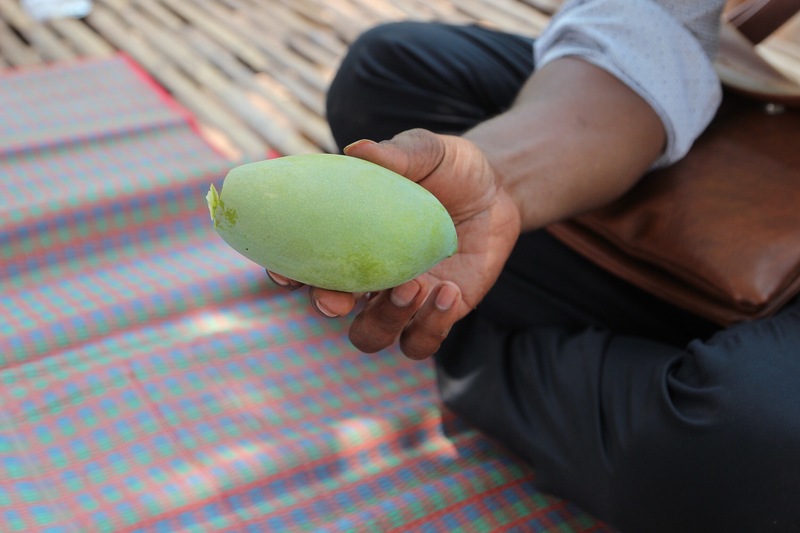 We sat under a tree on one of her bamboo tables and she offered us fresh mangoes right off of her trees. 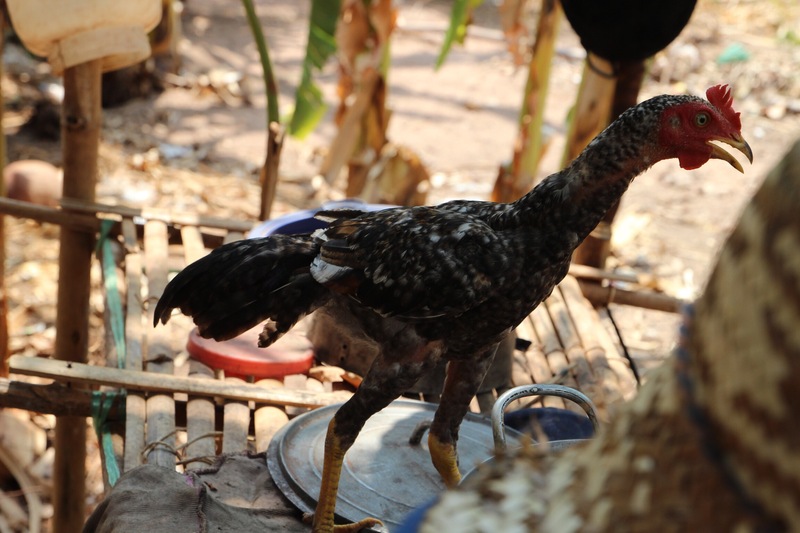 Surrounding us were many chickens and chicks, a dog, clothes hanging from a line and her house built out of bamboo and palm leaves. She did not speak any english, so Sin translated between us, as we wanted to know more about her and thank her for her kind gestures. She has a 19 year old daughter, who was sleeping inside and no husband. They did not have enough money for her daughter to stay in school, which costs $30 a month, so she dropped out at age 12 and began working. 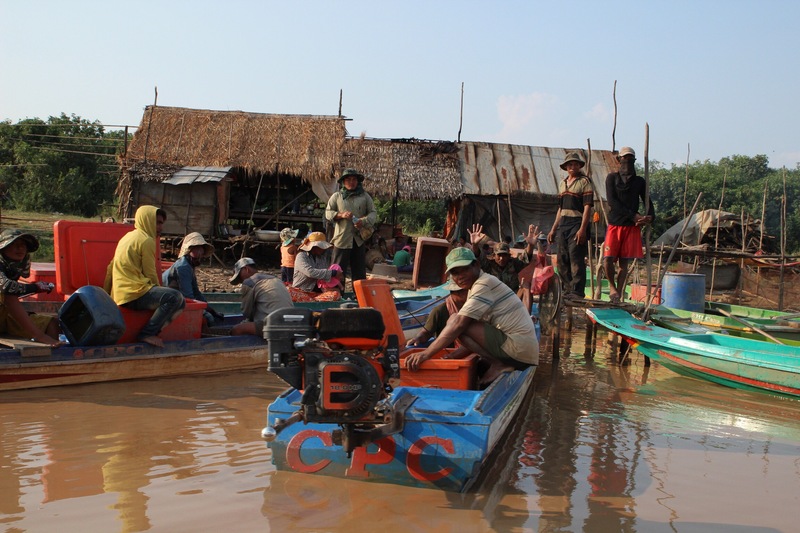 It is just the two of them and they work only during the 6 month rainy season in the rice fields. Currently, since it is the dry season, they have no work and they are trying to live off whatever money they have left from the last season they worked. She said she was lucky because two years ago an outreach company installed a water pump in her yard to give her access to water. This water is not clean enough to drink, but it is ok to use for washing and can be purified with the water purifying tank that they were also supplied with. 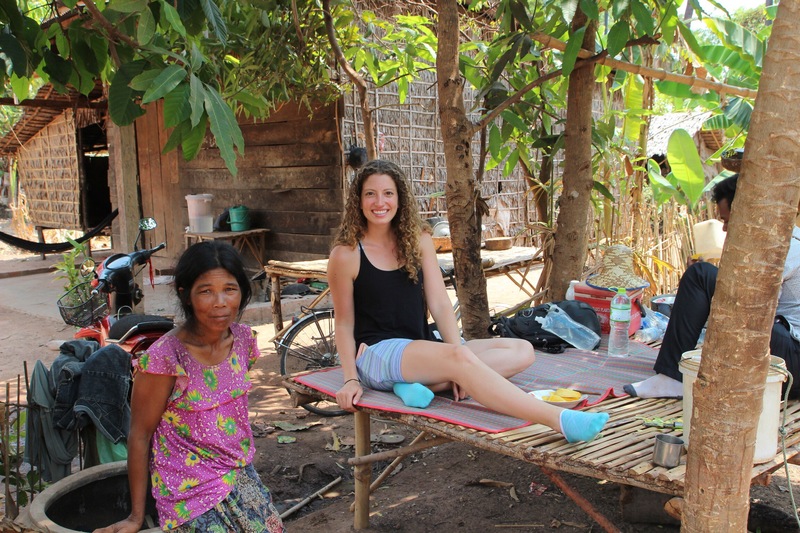 We spent about two hours at Thoa’s home and were so grateful for her hospitality. Although it was not a planned part of our day, it truly gave us an experience that we couldn’t have found through any of the other large tour companies. 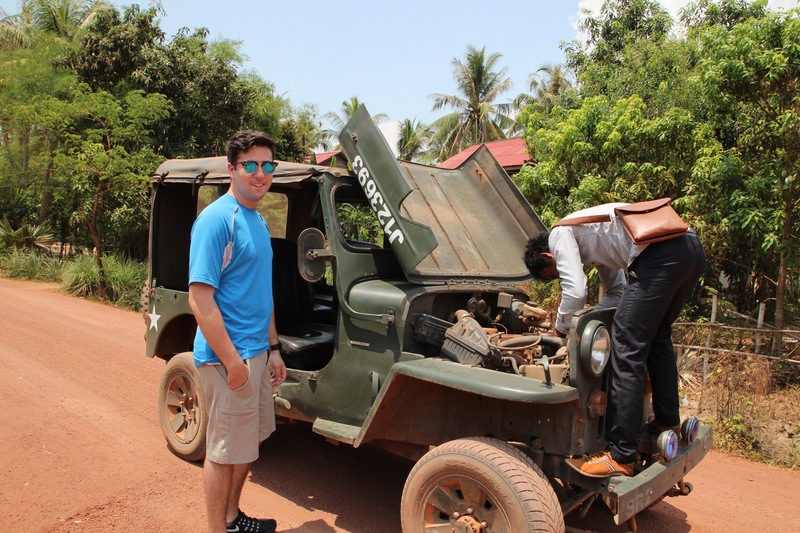 Upon arrival, it was apparent that the Jeep was not going to be able to be fixed today, so Scott, Sin and the mechanic backed it into Thoa’s driveway. 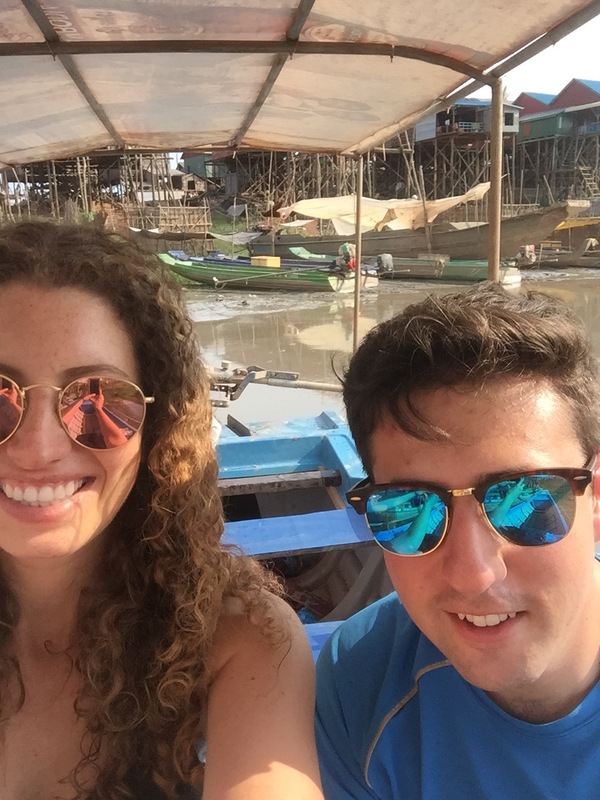 Scott then said we would all hop into his personal vehicle and continue on to our first destination, Tonle Sop, the largest lake in Cambodia. We were truly impressed with the way that Scott handled the whole situation. He dropped everything he was doing that day and came out to, not only try to fix the car, but make sure we accomplished everything we had planned to do that day. 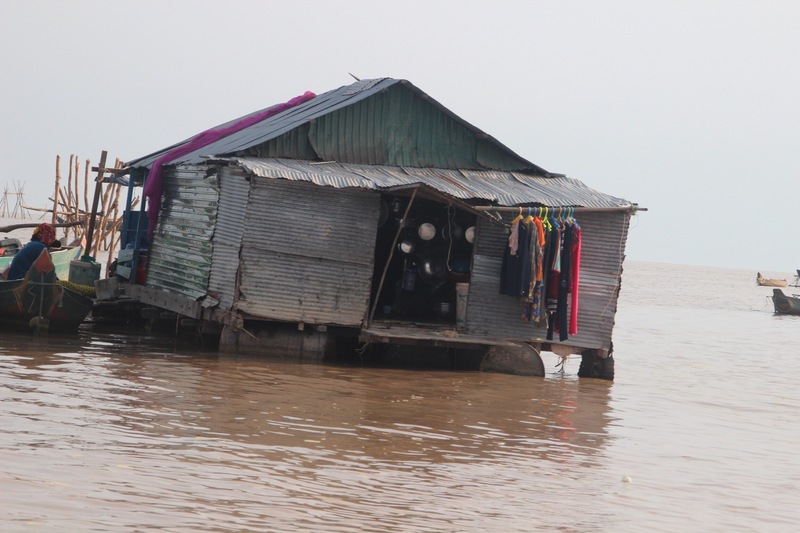 We drove to the lake and as we were driving began to see houses that were high up on stilts. Scott told us that the lake, during the rainy season, begins to rise and many of the roads that we drove on are under water during that time. We arrived at where the boats let out and were instructed to go to boat numbered 20, however I think our boat’s number was 15. Anyway we climbed into the boat and it was apparent that the water level was unusually low. The water was not really water, it was a viscous mud that we could barely motor through. The motors on these long boats were basically old lawn mower motors that have been tied sideways and welded to a long shaft with a propeller at the end. The shafts were about ten feet long and as they were used, they sprayed the muddy slop everywhere behind the boat. As boats passed one another, it initially seemed common courtesy to either take the propellers out of the water or just slow down significantly as to not spray each other. However, the second boat that passed us did not do this and proceeded to spray us completely, from head to toe, with this muddy mucky water. From that point on, we no longer trusted any of the other boats that passed. So for the rest of the trip we took cover during any of these moments. Every so often the boat had to stop to untangle something from the motor, either a piece of cloth, string, plastic bags, etc. After about 30 minutes of riding through this winding and shallow water, I wondered if there really was any lake left. Being that it was the dry season and it seemed that there was even a drought at the moment, I was almost convinced that the entire lake had dried up. I had seen the lake on the map and read about how large it was, so part of me could not believe this was possible. As I was contemplating this, the narrow stream opened up into a vast and enormous lake. 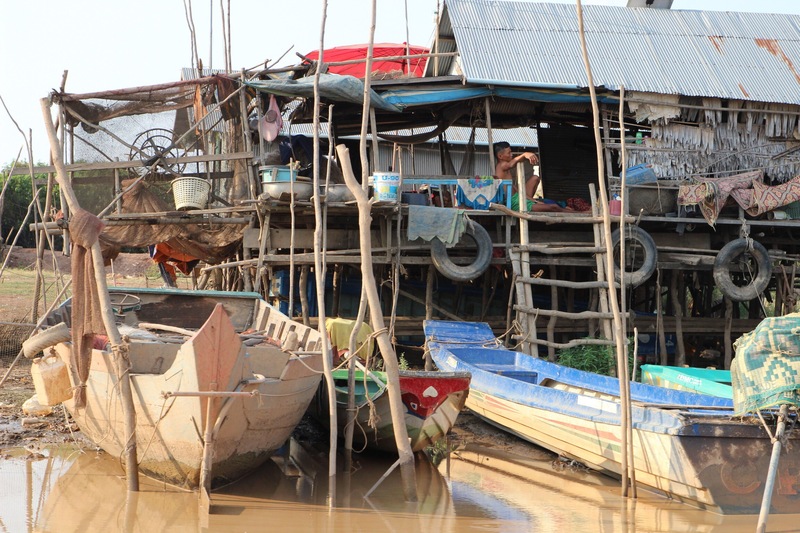 We had finally reached the floating village, which was also a shock to us. 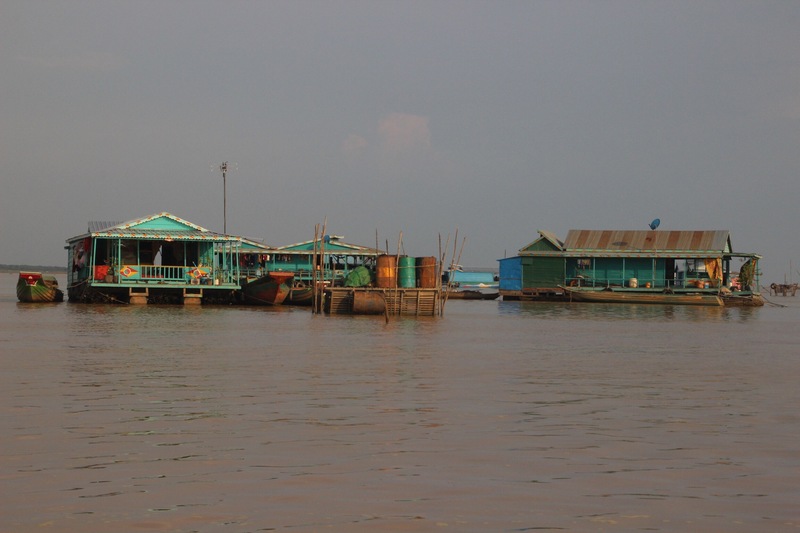 When I had looked up photos of Tonle Sop, most of them were just of these tall stilted homes that were completely surrounded by water during the rainy season. I had not seen a single photograph of what we were witnessing at the moment. I have to admit, the entire day was a decent amount of culture shock and this was one of the peaks of it. This village was a culmination of homes and fishing houses that were floating either on old barges or empty barrels. 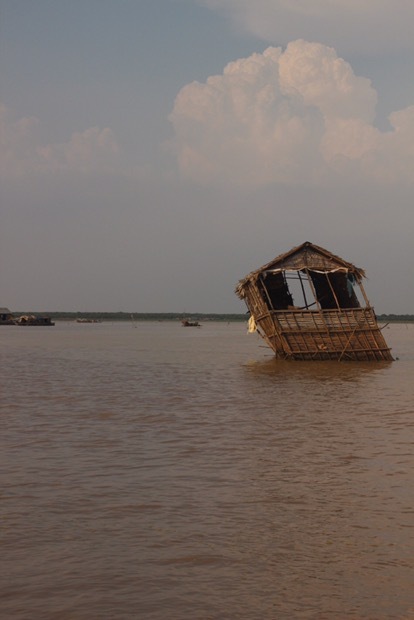 They looked almost exactly like the homes along the river on stilts, except they were completely floating on the water. 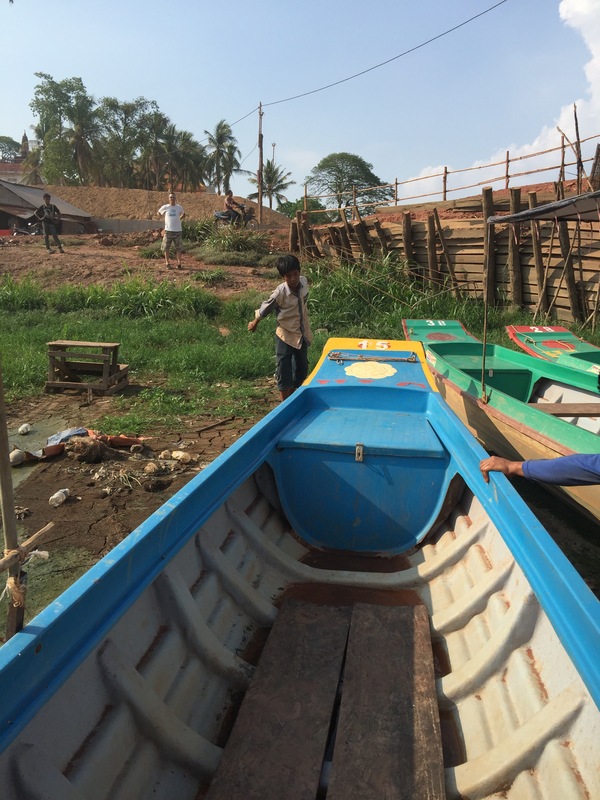 Depending on the time of year and the height of the water, the village moves around and anchors where it is in the shortest boat ride to land. This is where most, if not all, of the fish and seafood is sourced for many of the towns near the lake. We spent about 20 minutes boating around the village and then headed back in to land. Another 30 minutes later, we were back and we hopped in the car and headed for one of the older and more remote temples to try to catch the sunset. Being that we were a little delayed due to the Jeep incident, we were cutting it very close. 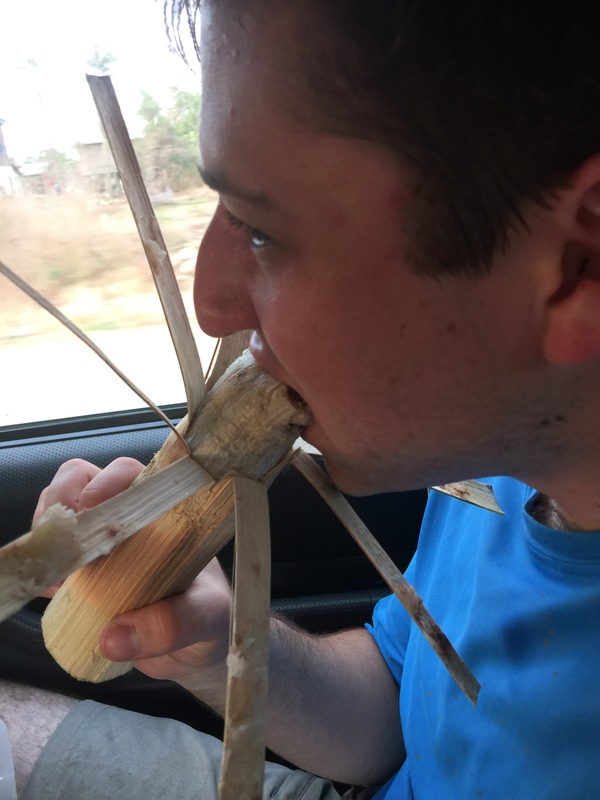 As we were driving we noticed that there were many stands no the side of the road, run by women, with foot long pieces of bamboo standing on a hot, smoking grill. We had seen this on our way from Vietnam into Cambodia and were curious about what they were. Scott explained that they are filled with sticky rice and beans, and we immediately said, “STOP!! 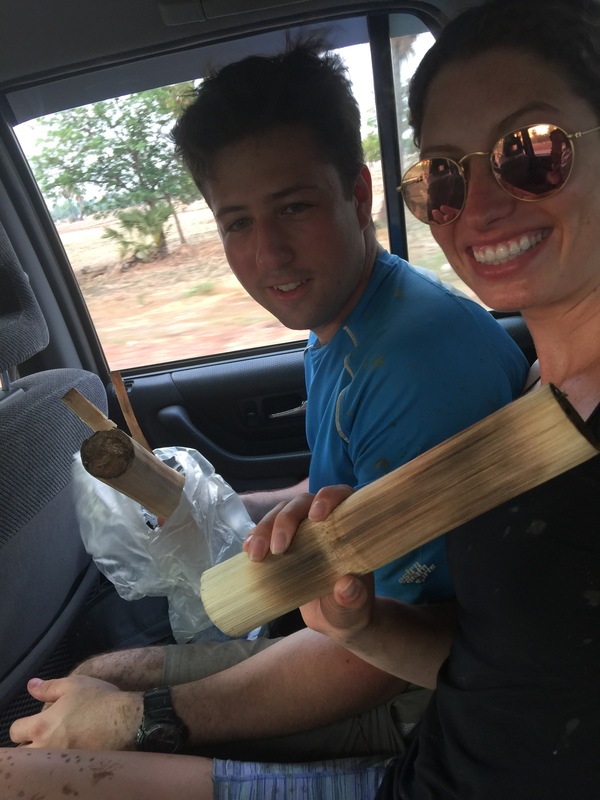 We have to try this!” We pulled over for all of three minutes and each grabbed a bamboo stalk and were on our way. At first steven and I held them, looking at them intensely and wondering…How in the world do we eat this?! 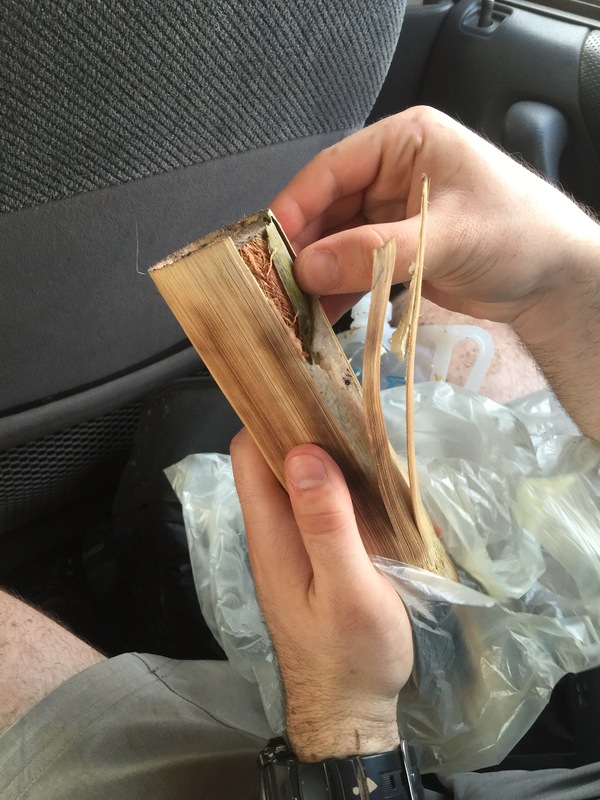 Scott turned around and said “just peel it and eat it like a banana.” We began to peel them open to find the sticky rice and beans packed into the inside of the bamboo stalk and covered with some banana or palm leaves to keep everything inside. The rice was sweet and sticky and oh so good! It was the perfect snack/lunch as we had only had mangoes waiting at Thoa’s house a few hours earlier. Being that it was 5:40pm and we were trying to make it to the sunset, we enjoyed the sticky rice and planned to eat dinner later with Gavin and Gillian. 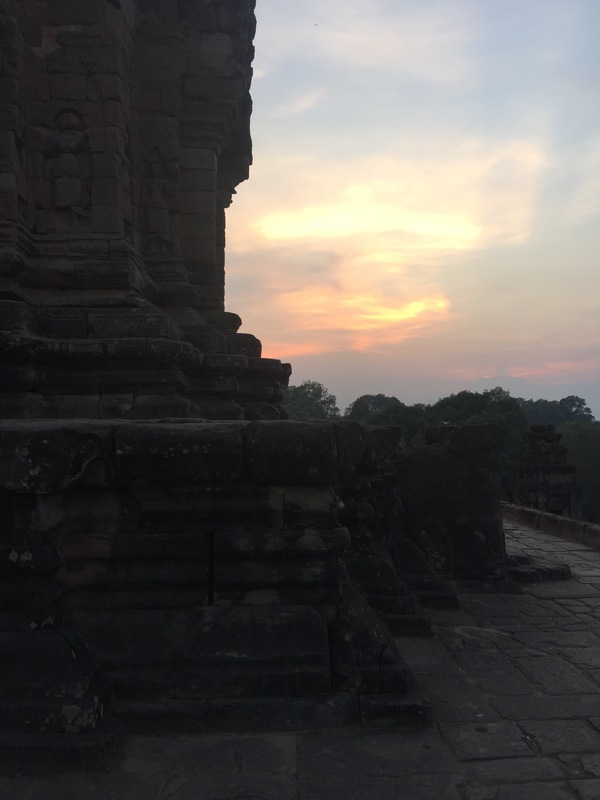 We arrived at Bakong Temple a little after 6pm, and sunset was at 6:20pm. 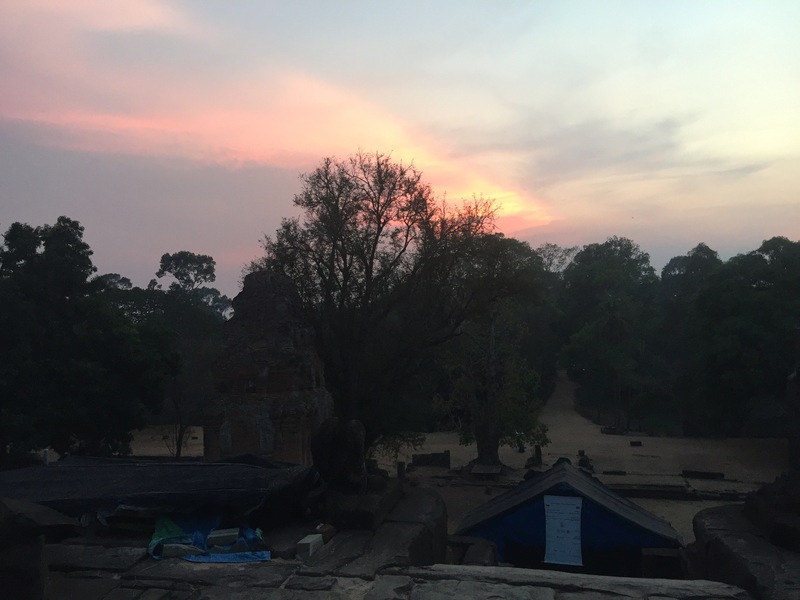 We climbed to the top of the super steep stairs and made it to see the changing purples, oranges and reds of the beautiful sunset from the top of Bakong. This was originally where the capitol of Cambodia was back in the 8th century before it was moved to Angkor in the 12th century. The sunset was a great way to end the day’s adventures. 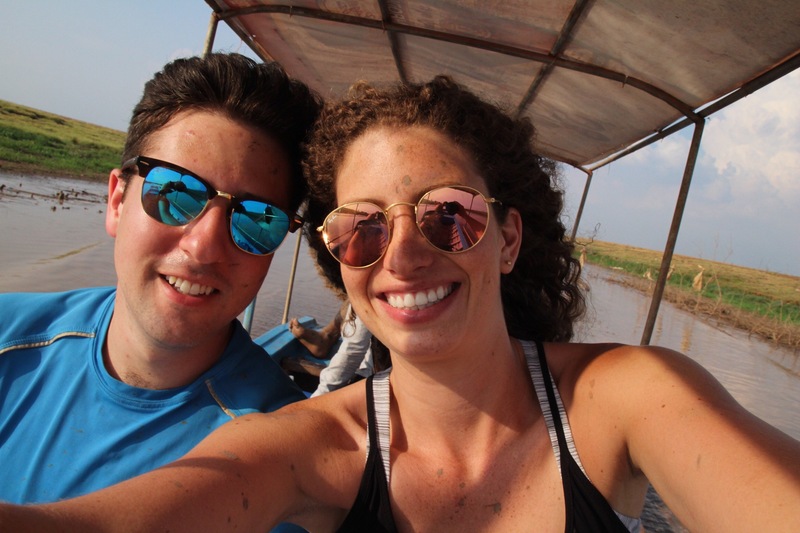 We headed back to the hotel in desperate need of showers, since we were still covered in mud from the boat ride. We then met up with Gillian and Gavin to have some birthday celebrations on Pub Street. 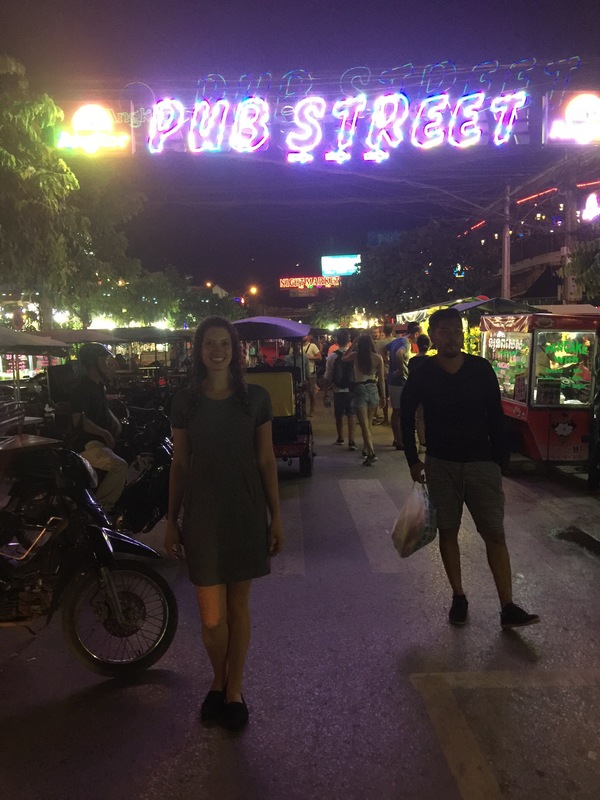 We checked out a few of the bars and had some drinks. We also enjoyed dinner by the river from a few of the street food stands. 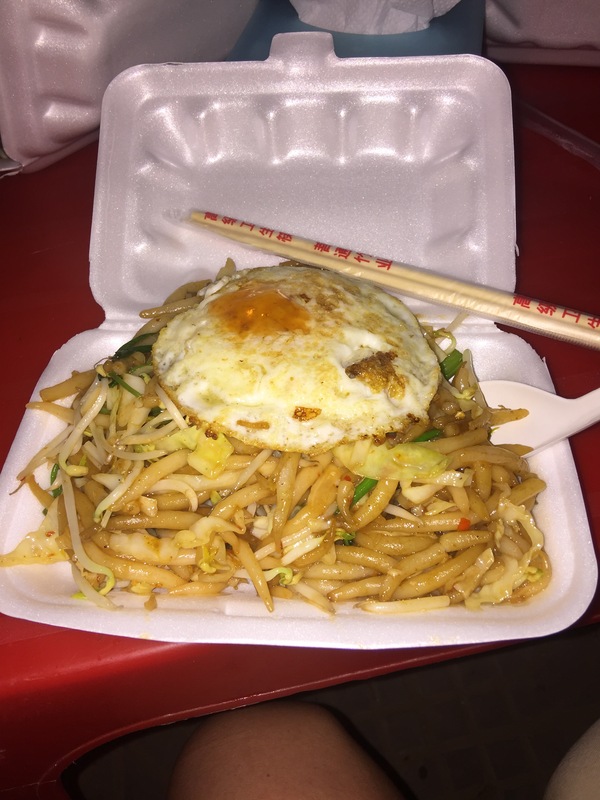 We had noodles with egg and veggies as well as a pork bun. We really had quite the eventful day for Jess’s birthday and it will be one that we will never forget! The next day, we planned for some of our time in Thailand and our trip to Laos, poolside at The Sarai. We had lunch at Sarai’s Goat Tree Restaurant. The chef prepared a fixed menu for us by the pool. 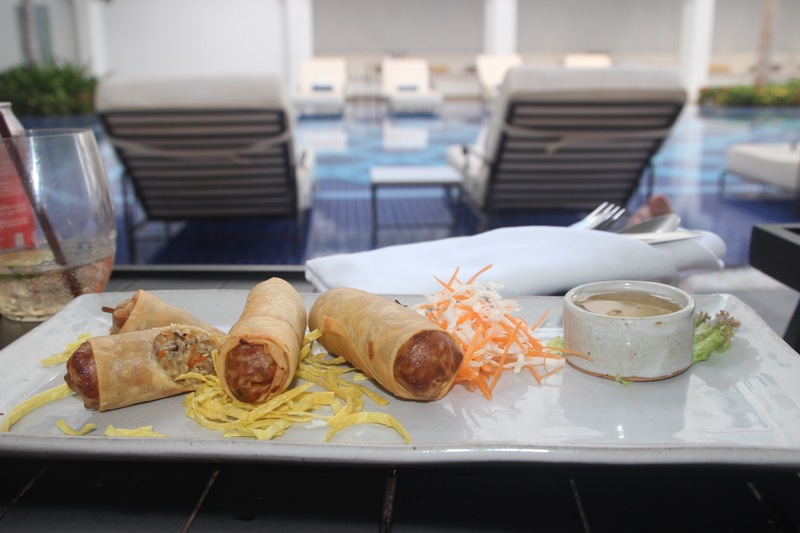 We started with the fried pork and faro spring rolls. 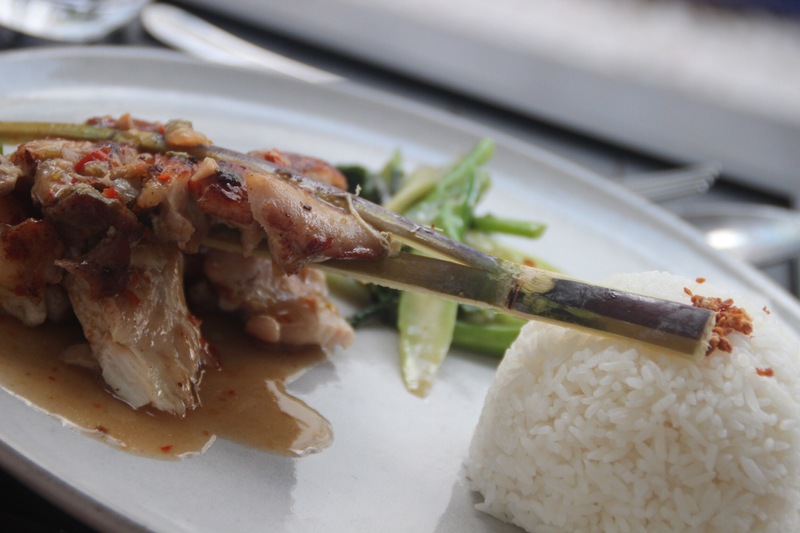 Then enjoyed sugar cane chicken with bok choi and rice. 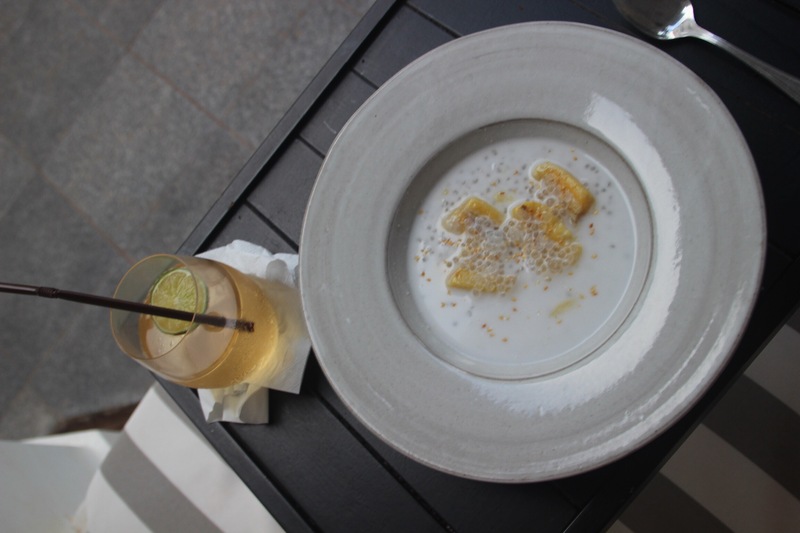 We finished with a warm coconut flavored tapioca dessert with fried bananas. Everything was very delicious. Later that evening we enjoyed a celebratory dinner at Hang Bay at the Phum Baitang Resort. This was a meal we will never forget, in addition to the incredible grounds of the resort. They have only been open for about 8 months, so everything is brand new. We were told that Angelina Joli came to stay for three months to film a movie and do charity work here. The decor was very upscale Cambodian style and the restaurant was air conditioned, which was nice. 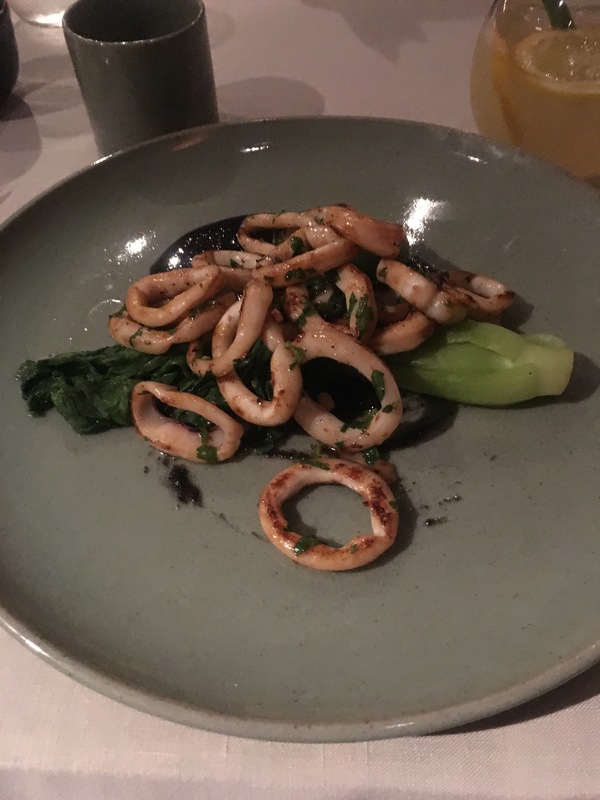 To start Steven had the grilled squid with bok choi. I had the most incredible appetizer. It actually blew my mind completely!!! 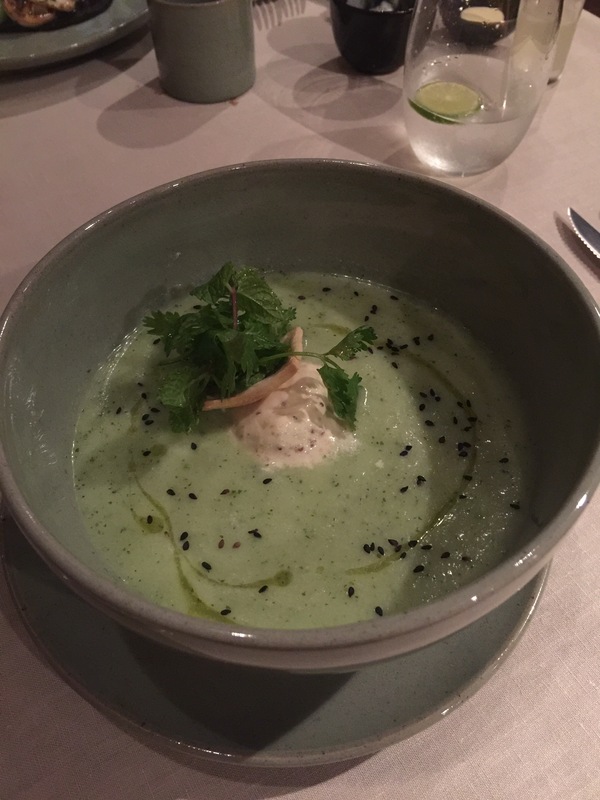 It was a chilled cucumber gazpacho…sounds boring, right? Well, the chef really spiced it up by adding MUSTARD ICE CREAM! I couldn’t believe it when I saw the menu and I had to order it. It was also garnished with fresh mint and a small cracker. I absolutely love mustard and could not believe some genius decided to make it an ice cream flavor to add such incredible depth to a chilled soup. I will forever dream about this dish. As our main courses, we shared the angus wagyu ribeye with smooth mashed potatoes and the Cambodian amok, a local fish, with coconut cream, steamed rice and fresh vegetables. 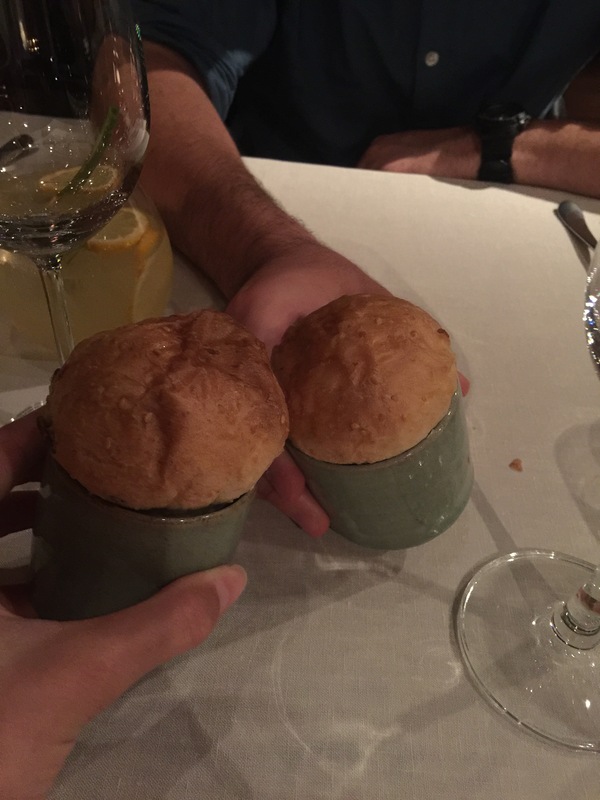 Both dishes were very good. 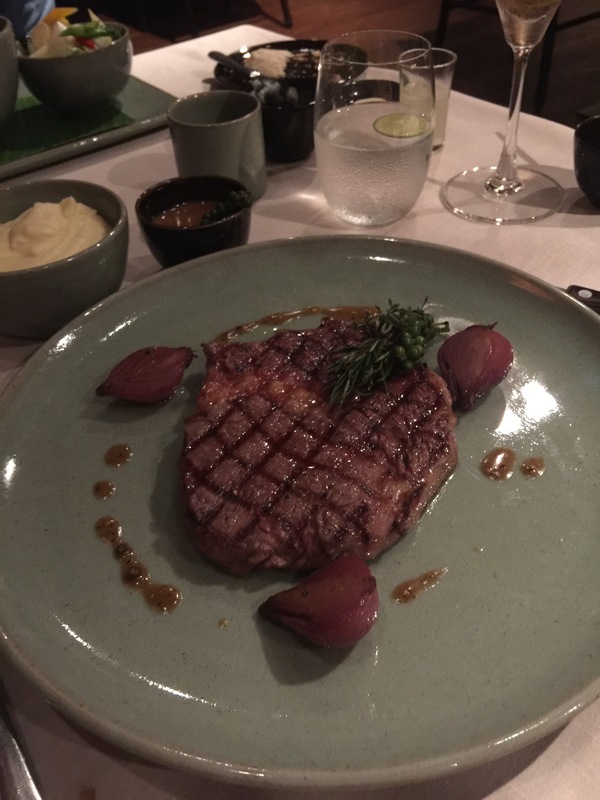 The steak was ordered rare and it was cooked perfectly. The fish was very moist and flakey and had great flavor from the coconut. We were way too full for dessert, so we headed back to the hotel for a good nights rest. Next, we are off to Bangkok and we are so ready for our three weeks in Thailand! !